Our 14 French students travelled from France to experience life as an Irish student. They arrived in Belmullet on the 14th April and were greeted by their host families. The following highlights the activities they completed during their stay. 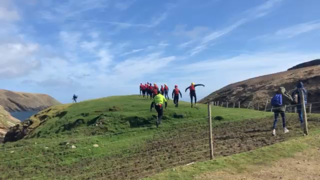 On Monday 16th April, the Erasmus group went to the shore in Knockshamboo. Unfortunately, the weather was very wet and there were high winds, so we were not prepared for such events. Some of the group, collected mussels, cockles and algae, such as sea lettuce and carrigean. We decided to go for a walk not far from the shore, to let the French students experience the views of where we live. Sights such as cliffs, fields and bog land, they got to experience. On the walk we also walked by a farm, this let them observe part of Irish culture, as farming is a big tradition in Ireland. On the farm, we encountered animals such as, cows, geese and donkeys. Some the French students had never seen these animals in real life! On Monday evening we organised Ceillí music for the French students. There was classical Irish music played and there was food served in the hall. 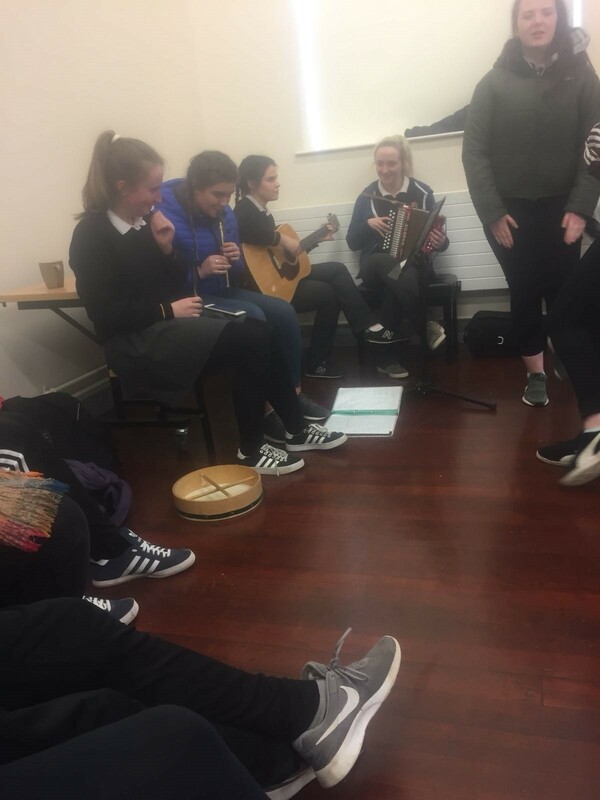 The band was made up of students from our school Moya Rowan, on the acoustic guitar, Siobhan Lavelle had a short but sweet time on the accordion, Hannah McGuire and Ruth Tighe played the bedtime blues on the tin whistle and provided vocal support. The band played classics like Hills of Donegal, Black Velvet Band, Auld Triangle, Wild Rover, The Fields of Athenry, and other Irish classics. Alex and Jamie both sang a song and the two Patrick Gaughan’s sang Grace and brought a tear to the eyes of every child and adult in attendance. The French students loved the traditional Irish music. On Tuesday the 17th of April, we all went to the sports hall where Mr Reilly was demonstrating how to play Gaelic football and skills involved in the sport. This was a great way to introduce the French students to Irish culture and sport, as sport is a big part of the Irish community. After we completed the skills, and everyone knew how to do them and attempted them. We then explained the rules of the game such as, fouling and tackling. We all got split up into 5 teams with French and Irish mixed. We competed against each other and if you scored it was 3 points. This developed our teamwork skills, and our communication skills. This blitz also developed our leadership skills, which we developed from a course that we had completed earlier in the year. Everyone enjoyed the evening and it was a great way to bond with the French students. At 9:30am on Wednesday morning, we headed for Achill. Ms Carey and Ms McAndrew accompanied us. The journey took an hour and a half. First, we went on a walking tour of a Neolithic village. It was very interesting. The tour guide explained the history of the area and all about how the Neolithic people settled in Achill, how they were self-sufficient and why they ended up having to leave the area. We then went into Achill Aquarium and observed all of the marine life. We saw all kinds of crustaceans, fish and other sea life. We found out lots of interesting facts about how these creatures live, feed and protect themselves in the ocean. Then we watched a short documentary on sharks in our seas. At approx. 1:30pm we were bussed to a local restaurant for food. It was delicious. We had time to mix with the French students. Finally, we moved on to Castlebar to have a look around the shops. We arrived home around 7pm. 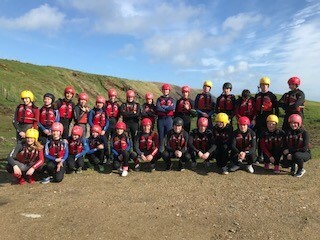 On Thursday the 19th the TY’s and the Erasmus exchange students from France went coasteering as one of the activities planned for the week. We left the school at around 9.30 and went down to Erris Head. We were met by David Tyrell and the instructors. He gave us all wetsuits, lifejackets and helmets. He also split us into two groups. Then he explained what coasteering was and what we would expect out of this experience. Then we did a quick warmup before we got in the (freezing)water. We followed the instructors to the pier and we each jumped in one by one. The first jump into the water was freezing but we got used it. We swam around to each cliff and climbed the rocks up to the ledge. The highest jump the instructor told us was around 10 metres high which is the same as an Olympic diving board. We spent about an hour and half in the water. When we were finished we went back to the school and some hot chocolate to warm up. On Thursday, 19th April, the Erasmus students visited Blacksod Lighthouse. Blacksod Lighthouse is located at the southern tip of the Mullet Peninsula, overlooking Blacksod Bay. Vincent gave us a brief tour of the lighthouse and its history. The lighthouse was built in 1864 by a local merchant, Bryan Carey. It famously recorded weather observations in June 1944 that caused the Normandy Landings to be postponed. D-Day was scheduled to commence on June 5th 1944, but lighthouse keeper, Ted Sweeney’s report of approaching bad weather caused Eisenhower to delay the invasion until 6th June 1944, when conditions were better. The lighthouse is a two-storey, square building built from granite found locally. The range of the white light is 14 nautical miles, and the range of the red light is 10 nautical miles. The light flashes twice every 7.5 seconds. The height of the light is 13m above mean high water springs. 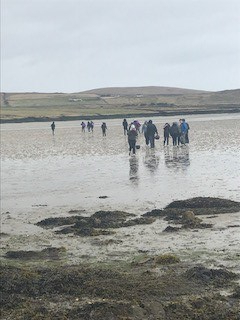 Our students also went foraging for local Seaweed at Blacksod with Ann Ruddy. Ann explained to the students what species we were looking for and the properties that each type of seaweed had. The students at OLSS and their French partners must be aware of the nutritional value of all the types of Seaweed that they use in their recipes. Once the Seaweed is collected it must be kept in seawater until it is ready to be used.